Humanity's exploration among the stars have brought it into contact with several alien species. All of these contacts have been peaceful, except for a shirt war against the Sung. Humanity had never met an alien species which presented a serious threat to its own species ÃƒÂ¢Ã¢â€šÂ¬Ã¢â‚¬Å“ until the Kafers. Humanity's contact with the Kafers is probably the most significant event in human history since the Twilight War of the late 20th century. The encounter, like that war, could conceivably spell the end of the human race. The Kafer Sourcebook contains al information necessary for the 2300 AD referee to create campaigns and adventures involving the Kafers. It describes the physiology and psychology of the Kafers, concentrating on their unique intelligence, and explains why there can never be peace until either humanity of the Kafer population is destroyed. Covering the origin and evolution of the Kafers, the Kafer Sourcebook goes into the details of the Kafer homeworld and explains Kafer motivations and drives, their history, their society and social structure and their technology. The Kafer Sourcebook details the political and governmental structure of the Kafer Associative, discusses the political motivations behind the current war and explains why it will get worse. The Kafer Sourcebook enables the 2300 AD referee to introduce new items of Kafer weaponry and equipment, as well as more complete details of previously described items. The equipment chapter is copiously illustrated (with some illustrations in full color). The players can be introduced to Kafer artifacts, which range from hand tolls and small arms up the Sigma-class starship. They can puzzle out the true function of the enigmatic "worry stone" often found in abandoned Kafer encampments or try to discover the technology, behind the recently discovered "Kafer Computer Mark II," an advanced portable computer of chilling technological sophistication. A full-color map of the Kafer Sphere is included, extending tbeyond the boundaries of the original game map. The Kafer Sourcebook also presents a complete listing of the more than 30 new stars not included in the original game map as well as those already covered. 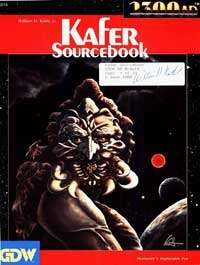 Introduced in the Kafer Sourcebook is a new alien race, unknown to humanity so far but important to the understanding of certain aspect of Kafer technology and history. The Kafer Sourcebook also presents a treatise on Kafer language, including a pronunciation guide, a short vocabulary and samples of Kafer ideographs.